Spend New Year’s Eve in one of the most talked about locations in the world and bring in the New Year with a bang. 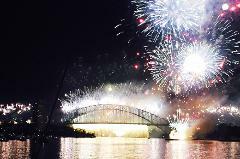 SEE THE SPECTACULAR SYDNEY FIREWORK DISPLAY AND ENJOY THE VIEWS OF SYDNEY HARBOUR BY NIGHT !! Spend New Year’s Eve in one of the most talked about locations in the world and bring in the New Year with a bang. See the spectacular Sydney firework display and enjoy the views of Sydney Harbour by night. With indoor and outdoor areas for viewing the display, skip the crowds and experience New Year’s Eve on a boat with Sea Sydney Harbour. It will be a night to remember! Nevaeh is a spacious catamaran that can accommodate for up to 30 guests. The 10.5 metre Seawind Resort 1050 has a large internal cabin and cockpit area with easy access to the front bow area. The vessel allows for guests to sit comfortably or move with ease while cruising Sydney Harbour. Ticketed cruises run for 7 hours from 6pm to 1am and depart from Thames Wharf, Balmain on the night of New Year's Eve. The vessel will take up position in a suitable location with prime views of the Sydney Harbour Bridge and spectacular firework display. Food and light snacks will be provided with a fresh BBQ to be cooked on board for all. Passengers can choose to BYO alcoholic beverages or additional food. No corkage fees apply. New Year's Eve on Sydney Harbour is perfect to experience with a group of friends or to bring along the whole family and enjoy breathtaking views of Sydney and the spectacular Sydney fireworks! • 7 hour cruise aboard Nevaeh with an experienced skipper and deck hand/host. An intimate cruising experience with maximum passenger numbers of 30. •	Pick up and drop off at Thames Wharf, Balmain. • Food and light snacks to be provided with a fresh BBQ to be cooked on board for all. Soft drink* and water to be provided. *(Availability on cruises may vary). • Option to BYO alcoholic beverages or additional food. No corkage fees apply.